NIA CHARLESTOWN NEVIS (January 23, 2017) — Prime Minister of St. Kitts and Nevis Hon. Dr. Timothy Harris thanked caregivers of the elderly on St. Kitts and Nevis. 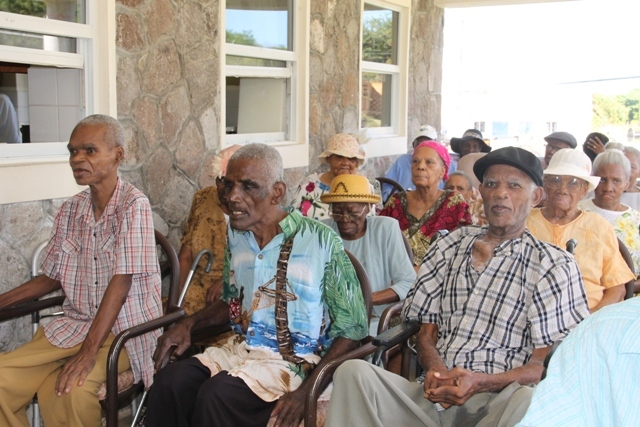 He told the Department of Information on January 19, 2017, that it was fitting to pay tribute to them now, considering the increasing number of centenarians in the Federation. 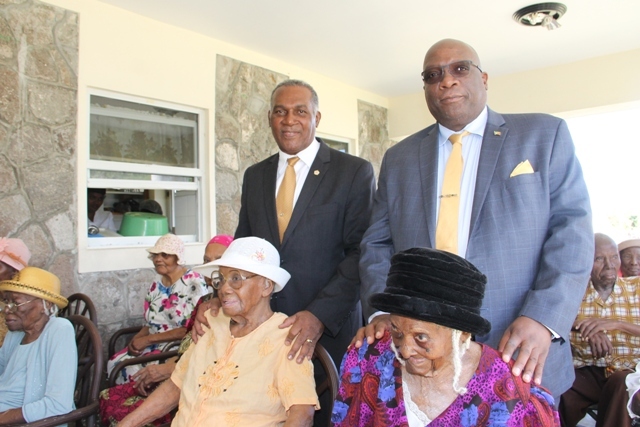 Dr. Harris, was at the time attending the 105th birthday celebration at the Flamboyant Nursing Home for the oldest living citizen Celian “Martin” Powell. “This is a high point in that we are adding to the numbers of our people who are living long, respectful lives and we want to pay a particular tribute to all those who give care to the elderly in our country at this moment in time,” he said. Powell, who is originally from Zion Village in Gingerland, is one of three centenarians who reside at the nursing home at present. The other two are Mrs. Rosetta “Rosie” Morton from Rawlins and Mrs. Artemisia “Etty” Jeffers from Hickmans. The Prime Minister also thanked God for the gift of longevity he has bestowed on the centenarians in particular Ms. Powell. Premier of Nevis Hon. Vance Amory said he was pleased to spend time with seniors at the Flamboyant Nursing Home. 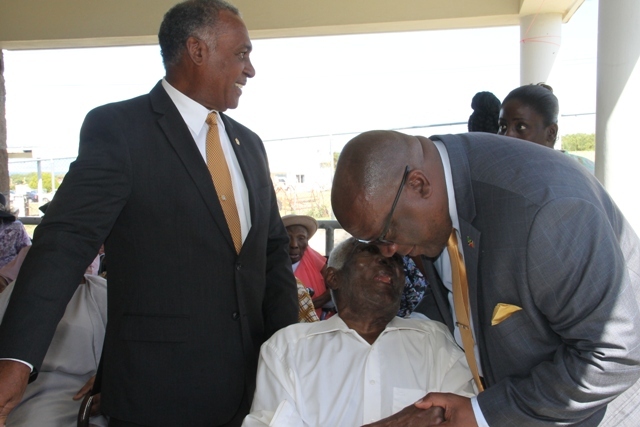 He, too, was attending Powell’s birthday celebration and used the opportunity to interact with residents there including the other centenarians who hail from his constituency, St. George’s. “To be able to be with other seniors at the Flamboyant Home is also a great pleasure and especially to be with the other two centenarians Mrs. Morton from Rawlins and Mrs. Jeffers from the Hickmans area, both of whom are from the Gingerland area, both of whom are related to me in one way or the other. Ms. Morton is blood family. Ms. Jeffers is married to my family,” he said. Meantime, Hon. 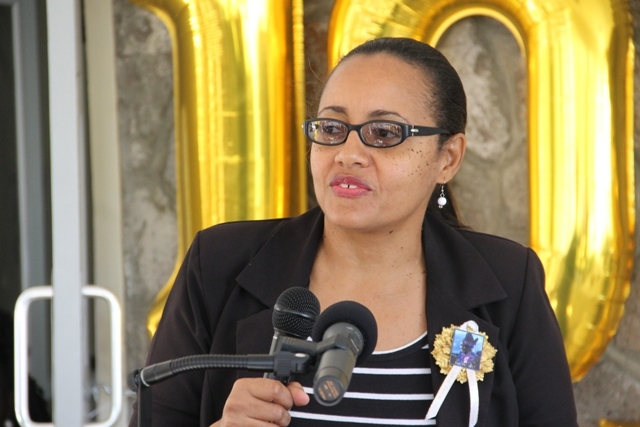 Wendy Phipps, Senator in the Federal Ministry of Health and Social Development while delivering remarks at Powell’s birthday celebrations, said she was pleased to be in Nevis to pay homage to the oldest living senior citizen in St. Kitts and Nevis. Ms. Powell was one of 18 centenarians in the Federation. “We have a total of seven in Nevis at the moment and 11 in St. Kitts and by the end of this year, we would be meeting the 20 mark because we have about two or three other seniors – one at least from Nevis, two in St. Kitts, who by the grace of God, we are hoping will make it to 100 by the end of the year,” she said. The government official also commended the Powell family for their continued care of their matriarch and care givers. She also pointed to the efforts of the Nevis Island Administration in caring for the elderly which she noted as a mark of respect for life and the preservation of life. Ms. Phipps stated that many advances have been achieved over the years in St. Kitts and Nevis since the oldest living centenarian was born. “In 1900, just maybe about 12 years before she was born, the average life expectancy was 49 and we are now at approximately 76 across the gender lines,” she said.